Vandy Vape Govad RTA Review - Daily Vaping Deals & The Best Vape Product Reviews at Vaping Cheap! Vandy Vape is a relatively new company in the vape industry, but has made a huge impact with their short time they’ve been releasing products. Some of the products they’ve recently released include the Vandy Vape iCon RDA, which is a collaboration with popular YouTuber Mike Vapes, the Govad RDA, Kylin RTA and more. 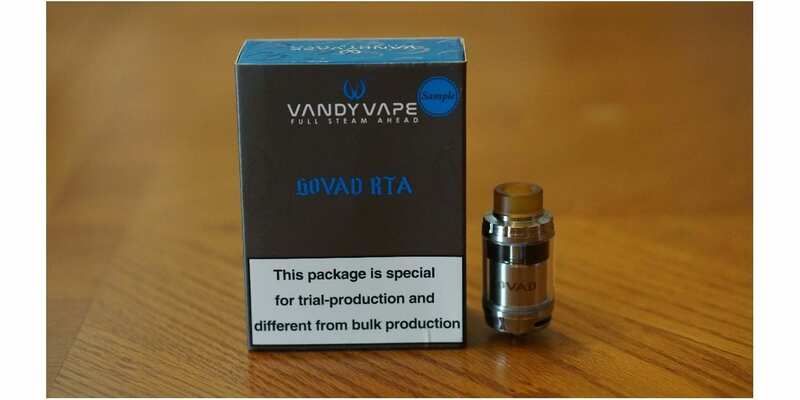 With how popular single coil RTAs have become, it was only a matter of time before Vandy Vape released their own, the Govad RTA. How does this RTA compare to the rest? We’ll find out in this review! Before getting any further, I would like to thank Vandy Vape for sending this atomizer out our way for the purposes of this review. I will go over my first impressions, building and wicking, performance, pros and cons and conclude with whether or not I recommend the new Govad RTA! Check Out Vandy Vape Here! Purchase Here! The Vandy Vape Govad RTA comes in a packaging relatively similar to most of their atomizers, which is not a bad thing whatsoever. The packaging we received is the sample version, so the final may packaging may differ. Once you slide open the box, you’re immediately greeted with the Govad RTA, a spare glass tank section and an extra 810 wide bore delrin drip tip. 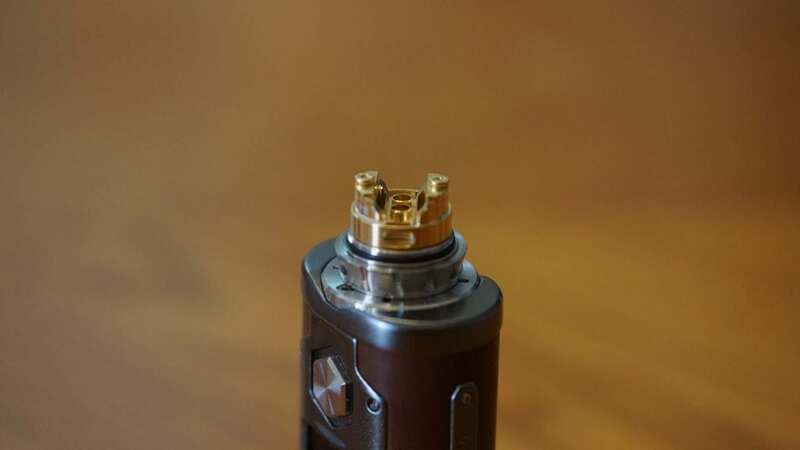 This RTA does come pre-installed with an Ultem 810 drip tip, and the insert which reduces the e-liquid capacity to 2ml, which is for TPD compliance. Included with this RTA you also receive a 510 drip tip adapter, different color spare o-rings, spare parts, the infamous mini blue screwdriver, and a spare 510 pin. All of the included extras is a huge pro in my opinion, as they do provide you with a lot of extras for the money. Also, the 510 drip tip adapter allows you to use your favorite 510 drip tips, which is another big pro in my opinion. My first impressions of the Govad RTA was that it’s pretty much the perfect size for a 24mm RTA. It’s not too large nor is it too small. As mentioned previously, it has a 2ml e-liquid capacity with the tank capacity reducer, but once you do take it out, you have a 4ml e-liquid capacity. I think the tank capacity reducer is a great idea, and is definitely unique as most atomizers come with a smaller tank and larger tank section. The color received was stainless steel, but there are tons of other color options available such as Black, Gold and Rainbow. The stainless steel and Ultem drip tip looks great together, and even if you didn’t like that drip tip, they do provide you with a black delrin 810 drip tip. When it comes to drip tip options, this tank has got you covered! Even though the base diameter is about 24mm, it does bulge out to about 26mm. 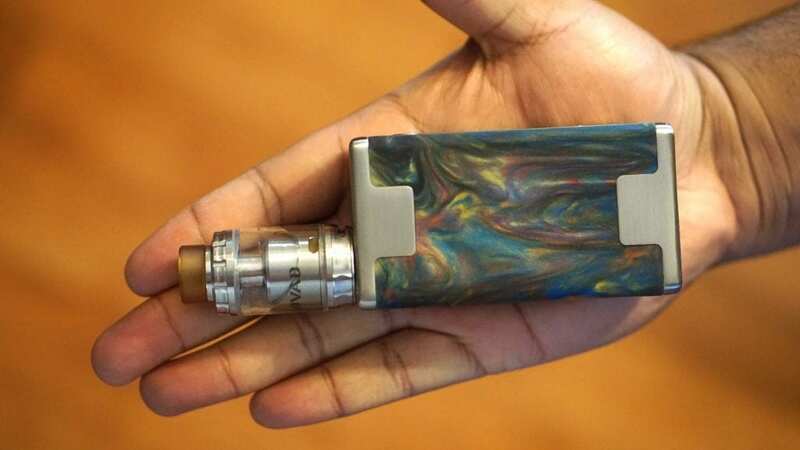 Some vapers may not like this design, but I do like this look. It kind of reminds me of the Pharaoh RTA, but not as noticeable to be honest. This tank simply looks great, and the design is well thought out. The Govad RTA does feature a top fill design, and the top fill section does have some knurling on it, so it makes taking it off very easy. The top fill holes are pretty large, so you can easily fit any type of e-liquid bottle with no issues. What’s unique about this RTA is that the juice flow control and airflow control are kind of connected, so when you close the juice flow control, it closes the airflow as well. More on this specifically later. The juice flow holes are fairly large, so I wasn’t worried about higher VG e-liquids with this tank. In addition, there is a good amount of restriction when turning the juice flow control. 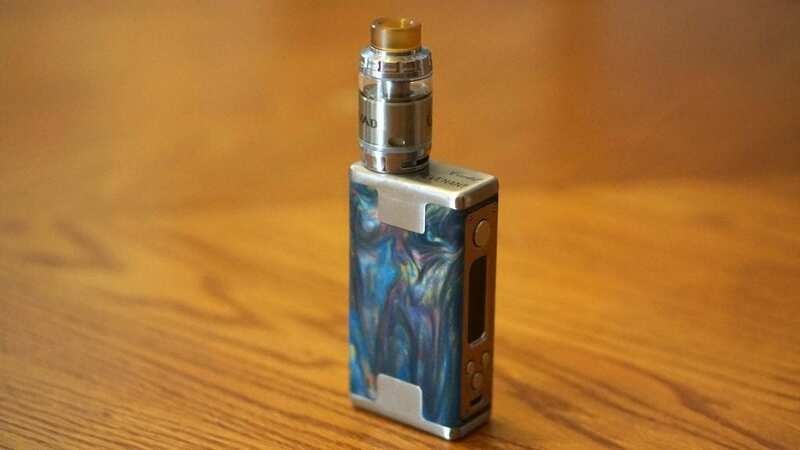 This is a pro for sure, as some RTAs have very loose juice flow control systems, and can be accidentally moved while vaping. The same can be said about the airflow control as well. Something worth mentioning is that this atomizer came clean with zero machine oil! This is another huge pro to us at Vaping Cheap, as we do hate when atomizers come drenched in machine oil. One wash with warm water, and this RTA was good to go! Overall, my first impressions of the Vandy Vape Govad RTA were great! I had zero cons upon opening up the packaging! I was definitely excited to see how this RTA vapes! However, we’ll first get into building and wicking. Like the Govad RDA, this atomizer features a clamp styled build deck. In addition, this RTA is designed for single coil, which is great to see as there’s tons of dual coil RTAs on the market and not as many single coil RTAs. The clamps are spring loaded, so it makes coil installs even easier! To install your coil, simply unscrew the post screws so that your clamp is raised high enough to fit your desired build. Be sure when you are wrapping your coil that the leads are facing opposite directions. Once this is done, simply insert your coil build, and tighten down your coil build. Now, this is the important part. Make sure that you cut the excess leads flush to the build deck. Not doing so can cause a short, which is something you surely want to avoid. There is a tiny bit of room you can get away with, but you rather be safe than sorry and cut the leads flush. Also, when you are installing your coil, make sure your coil is right on top of the bottom airflow, but raised a bit so that the side airflow channels are hitting the side of the coil. This ensures the best performance from my experience. The Govad RTA does have a pretty spacious build deck, so you can fit most of your exotic coil builds such as Fused Clapton, Staggered Fused Clapton, Alien and more. My preferred coil build for this RTA was a single Fused Clapton with 26GA NiChrome 80 for the inner cores and wrapped with 36GA NiChrome 80. The resistance of this specific coil was around 0.4 ohm. Wicking this RTA is pretty straightforward as well. It does have wicking channels, making it a bit easier for you, but you can easily run into some issues if done incorrectly. I do recommend to simply lay your cotton into the wicking channel, and make sure it’s fluffy and can move around in the channel itself. Stuffing cotton will result in some dry hits, so this is something I do not recommend. In addition, if you have too little wick then you will get leaking. However, once you cover up the entire wicking channel and your cotton is just laying in the channel, you’ll be good to go! It really is easy, especially if you’re an advanced user. I don’t think beginners will have much issues either. Overall, building and wicking the Vandy Vape Govad RTA is pretty easy and it really doesn’t take that long to get a coil in and wicked. The entire process can literally take me less than 7 minutes, which is great. Now the biggest question of this entire review is probably how does the Govad RTA perform? Well, I can easily say this tank has excellent performance! As mentioned previously, my preferred coil build was a single Fused Clapton which had a resistance of about 0.4 ohm. I did try other builds such as Stainless Steel Fused Claptons, which worked perfectly as well. However, normal round wire builds don’t perform as well. I think this RTA is much suited towards your larger coil builds. This RTA has tons of airflow! This RTA does have “3 Dimensional Airflow”, so you have airflow hitting under the coil and the side of the coil. I do like this type of airflow, and it does work quite well in this atomizer. With the airflow wide open, there is hardly any restriction whatsoever, and it does hinder the flavor a bit. However, when you close the airflow just about half way the flavor increases tremendously, and it does add some restriction, which is my preferred way to vape. You can close the airflow fully if you’d like as well. If you like tons of airflow, then you’ll love this RTA wide open. As mentioned in the first impressions, the juice flow control and airflow control is kind of connected. So when you close the juice flow control, you also close the airflow control. This didn’t always work for me, as I’ll close the juice flow control and the airflow would close off only half way. This really didn’t bother me much since I didn’t experience any leaking even when filling with the juice flow control open. Also, I experienced no seeping from underneath the atomizer either. Not to mention, filling this tank is easy due to it’s knurled design, and quick since it has large fill ports. The flavor on this RTA is very good, especially when you close off the airflow a bit. The vapor production is also excellent! When you have the airflow wide open, you’ll definitely be able to cloud chase with this tank. Honestly, I was quite surprised by how much vapor can be produced with a single coil and I was certainly impressed. The included drip tip is comfortable to use, and I found myself using the Ultem 810 drip tip more than the Delrin or 510 drip tip adapter. When chain vaping, the Govad RTA had no issues keeping up. Remember, wicking is key with any RTA, so once you wick this atomizer correctly, you’ll experience nothing but excellent flavor and plumes of vapor! Something else worth mentioning is that I had no issues with high VG e-liquids. All in all, the performance of this RTA was stellar! I literally had no issues with this atomizer when it came to performance. In conclusion, the Vandy Vape Govad RTA is an excellent performing RTA, and honestly it was hard to find any cons with it. The con of the flavor being a bit muted can easily be solved by closing off the airflow a bit. The fact that it’s a single coil only RTA is not necessarily a con since vapers will know this fact before making the purchase. The spring loaded clamp styled deck makes coil installs incredibly easy, and wicking is not difficult either. Once you don’t clog the wicking channel with cotton, and you have just enough to completely cover the channel, you’re good to go with this RTA. In addition, the flavor and vapor production is top notch, especially when considering it’s single coil atomizer. I had zero issues with leaking, and it wicked like a champ even with high VG e-liquids. All in all, the Govad RTA is a solid piece of vape hardware that includes a ton of extras. They’ve covered pretty much everything with this RTA, and single coil loves will absolutely enjoy it’s performance. If you’re a vaper who loves globs of airflow, then this is something definitely taking a look at as well! With that being said, I can easily recommend the Govad RTA by Vandy Vape!